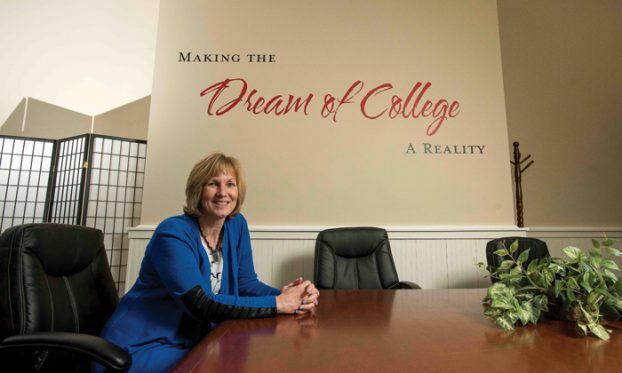 SALISBURY — Jennifer Canipe, 56, is retiring as executive director of Rowan County Crosby Scholars knowing that it is a much different place than it was in 2012. Back then, Canipe was a Communities in Schools volunteer at Knox Middle School, and the local Crosby Scholars program didn’t yet exist. But Canipe had a dream to start a mentorship program to prepare students for high school and beyond. At first, she tried to launch the program on her own. A mutual friend connected Canipe to Gwin Barr, and the two hit it off immediately. Barr is now president of the local Crosby Scholars board. “It was just one of those meetings where you could tell it was going to be the beginning of something big,” Canipe remembered. As they worked to get their original organization off the ground, the two were invited to Winston-Salem to learn about Crosby Scholars — a similar program under the umbrella of Goodwill Industries. Crosby Scholars helps guide students in middle and high school for life after graduation, preparing them for college or further education. Goodwill Industries of Northwest North Carolina, they learned, was interested in expanding Crosby Scholars to Rowan County. For Canipe and Barr, it was a godsend. Crosby Scholars had a similar goal for its own start-up but was capable of serving more students and had a 25-year track record of success. “It was all in God’s timing,” Canipe said. The two never looked back. “It just kind of transitioned into (Crosby Scholars),” Canipe said of the original plan. And when Crosby Scholars held its first academy workshop, she knew she’d made the right choice. The workshop was at Rowan-Cabarrus Community College, and Canipe said she vividly remembers the long line of cars looping around the parking lot to drop off students. Canipe said she felt pure awe. “I was humbled, and I was at the same time excited for the impact this program was going to have on this county,” she said. Five years later, that impact is plain. To date, 5,430 local students have enrolled in the program. This June, its third graduating class will number 500. In two years of providing grants and scholarships, Rowan County Crosby Scholars has given students in need close to more than $150,000. It’s a level of generosity that’s made possible thanks to the support of local philanthropists including Alice and Fred Stanback; Nancy Stanback and the late Bill Stanback; Greg and Missie Alcorn; Larry Cloninger; Salisbury Community Foundation; the Blanche and Julian Robertson Family Foundation; F&M Bank; and the Margaret C. Woodson Foundation. “I think the community was really ready for a program like this,” Canipe said. Canipe was originally selected to be an interim executive director, but it ended up being an extended appointment. She and board members joke that she’s the longest-serving “interim” they’ve ever heard of. She’s served for five years and describes herself as a “jack of all trades” who has a knack for bringing together people and services. When she thinks of leaving the organization she helped build, it brings tears to her eyes. But some things are more important. Canipe is leaving to be with her family and to better support her youngest son, David, as he prepares for college. But nothing will replace the time she spent with Crosby Scholars. Canipe and her husband, Robert, have two grown children and David, who is a high school senior. Rowan County Crosby Scholars began a nationwide search for a new executive director after Canipe announced her retirement in March. No replacement has been named.